etruscan bench. etruscan loveseat. neoclassical bench. 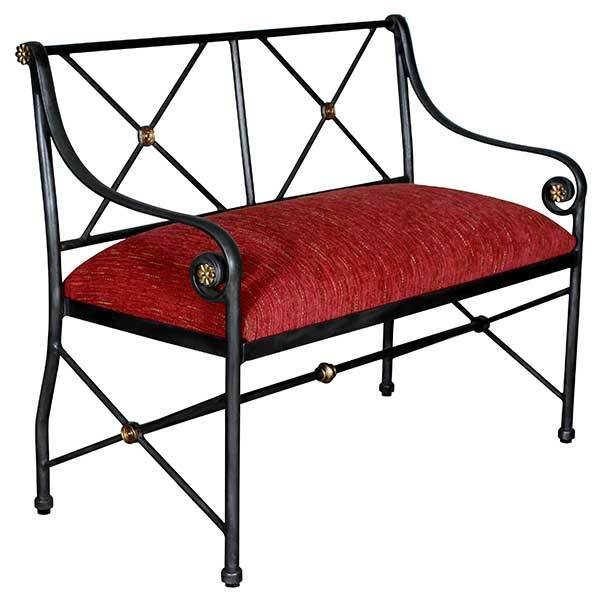 The Etruscan Two Seater Bench with Back was inspired by furnishings of ancient Rome. Etruscan is the modern name given to a civilization of ancient Italy. Its homeland was in the area of central Italy, just north of Rome, which is today called Tuscany. Culture that may be positively identified as Etruscan developed in Italy after about 800 BC. Around 500 BC the political destiny of Italy passed out of Etruscan hands, but the decline was gradual. The last of the Etruscan cities were formally absorbed by Rome around 100 BC. Ancient Roman architecture began with Etruscan styles which later gave way to Greek influence. The Etruscan Two Seater Bench with Back was designed by Shah Gilani, ASFD. With its understated elegance, the bench makes an ideal accent piece for upscale residential and commercial interiors. Robust metal construction ensures sturdiness. Upholstery is in COM. The seat cushion has 8-way hand-tied springs which will not sag even after decades of use. Four nylon glides are provided. Custom sizing is available. It is offered in a variety of finishes and accents. This exquisite bench was designed by Shah Gilani, ASFD.